I have to admit, my dad came up with today and yesterday's titles. I am not that clever. In googling how I might spell today's, I tried to refresh my memory (from college) about the meaning of existentialism. Apparently, perhaps due to paint fumes, I've actually gotten dumber since then. I couldn't make heads or tails from the few definitions I read. Anyone have a simple synopsis? First, I adore your painting style, Carol! I used your work as inspiration in 2 of my oil painting classes last semester. No simple synopsis, but I do love the painting. Love the painting. so now we know where you got your wordsmith skills. Dad's are a gift. I take existentialism to mean that although it may seem or feel like we live in a meaningless, undefined and confusing world, it is our personal responsibility to find the meaning and fulfillment in our own existence. Although each person has a different definition of personal fufillment, one must define his/her own interpretation of such and try to live their life to that degree.... I think? Whew. Don't quote me on that. Either way, I love the painting and it's a great title! I think naming paintings is one of the hardest parts! Those blasted paint fumes. ;) I really like the definition breakdown above. I see existentialism as the idea that we are free and responsible to create our own development and happiness through our choices. What Gina said. LOL, I couldn't define it either. I love the glass bowl. I like how the fork is refracted, and the cup and shadow show through. Only the rim tells me the bowl is there. Wonderful job of simplifying, Carol! I'd have been trying to paint every little glint of light on the bowl. 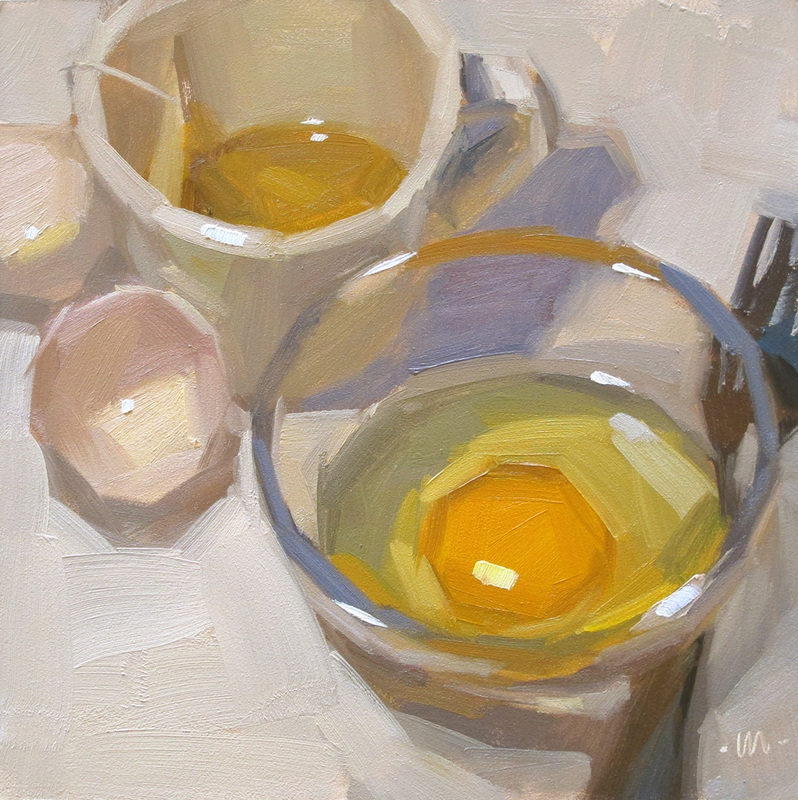 This is my favorite of these egg paintings. I love the lavendar shadow. Cute title too. Clever dad! existentialism = a state of angst about the meaning of life. This is my definition, anyway! A counter-productive state as it involves analysing and not doing. Unfortunately, I do this all the time. It is a brilliant description of your painting as no doubt the eggs are concerned about the meaning of their own existence now they are neither inside their shells nor forming a new life!!! I'm not sure if that exactly answers your question. But it does seem to be a universal searching for the reason for our existence. This is a beauty, deep in thought and depth today! This series is so appealing you've got me sneaking in an egg a say. Hi Carol, I have been admiring your paintings for years! Thanks for all of your daily jewels! It means that you define yourself by your intentional actions. (i.e., not a belief system devised by others and only expressed verbally) Existentialists believe that there is no certainty about what is right and wrong, and is therefore closely associated with situation ethics. Good painting! ...an egg a day... with a "d". Apparently, eggs do nothing for my typing skills.